NFC allows for one-touch smartphone pairing for easy control. Clean more clothes more efficiently with the Intelligent Wash System and KG Mode. Huge 12 kg capacity with large-opening porthole. 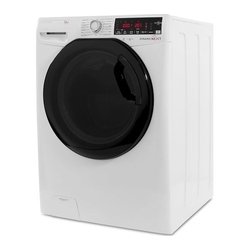 All in One Wash and steam functions let you clean colours and whites together. Quiet washing machine that helps save on energy consumption. Use your Android smartphone to control the Hoover DXOA412AHFN NFC 12 kg 1400 Spin Washing Machine. Just like a contactless payment system, you can tap your NFC-enabled device against it to access monitoring and management functions through the Hoover Wizard app. It's a more interactive way to keep your washing machine running how you want it to.